N: Quite a dizzy mix of light barley herbal with buttery and farm notes. Settles in the groove with herbal-sweet chewing gum overall - stretchy stuff, with smoked barley clearly evident. T: Bitter-sweet toasted char, light waxy herbal and sweet-peat - again, a heady mix. C: Nothing wrong here, but whether you'd pay £124 for it is another thing. The bottles [online] sold out within a few days, so that answers that. As good as it is, and it is good, it didn’t quite pull my heart strings. A palpably maritime nose – seaweed, rock-pools, ship’s timbers, smoked mussels and kippers; one panellist got vanilla ice-cream in a shaman’s tepee (herbal, medicinal smoke, soot, leather). The palate’s complex flavours – fish, fennel, shrimp, oak, vanilla, oven-roasted parsnips and chocolate cake, were infused with peat-smoke, herbal medicines and volcanic ash. 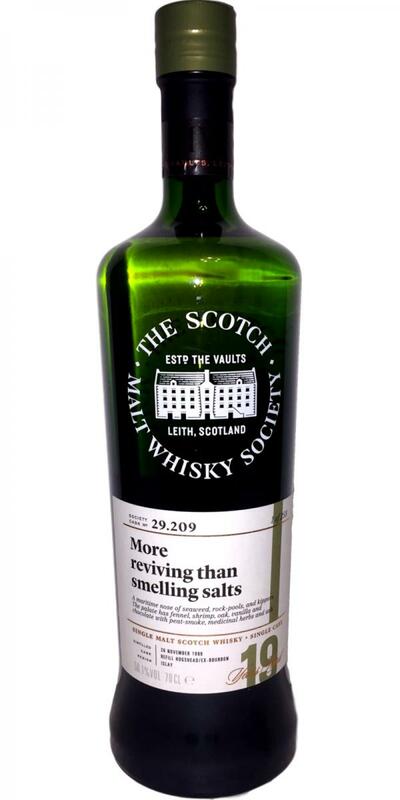 The reduced nose was more reviving than smelling salts – hot rocks, salted caramel, roast coffee, liquorice and rubber balloons – a good idea to keep some handy in case somebody faints! The sweet, earthy palate now had soot, peat ash, sweet tar, black-jacks and butter and strawberry jam on burnt toast. DRINKING TIP: A bit of a first aid dram – or with oysters if in good health.